It was nice, I like you but I want to say thank you and goodbye. This morning I officially got my Driving Licence! 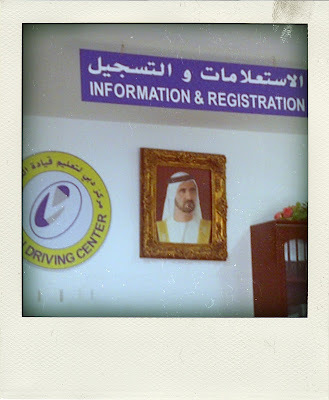 I am very grateful to the whole team at my Driving School, the Indian Receptionist, the Pakistani Driving Instructor, the Sudanese Manager... who were so kind and encouraging. I won the bet I made with the lovely Sasha at the reception: I didn't switch to automatic and I got it the first time. I have to admit waiting from 7am till 8am at the Driving School on a Saturday morning was stressful. Especially considering the fact that out of the 4 ladies waiting with me, some of which had failed already 3 times, I was the only one taking manual (I kind of got used to it). The instructor was a Woman, veiled, not very smiley, I got so nervous I warned her right away: "Hi, nice to meet you, I apologize in advance, when I am nervous, I talk, so there will be some talking."... Who says that? So here we go, just her and me, she seemed particularely tired or annoyed, there was a lot of sighing, not very encouraging. Ten minutes of driving and she asks me to switch places with her. I thought "Ok, I tried, I'll try again". She drives back to the School, asks me to wait for her inside, gives my file to the Sudanese manager without a smile, he looks at me "Pass". Seriously? Are you sure? "Yes pass". I think I litteraly jumped in his office and kissed him! Then he explains that I need to take 4 lessons on the high way. Because apparently, when it's over... Well there is some more! It never stops! I probably turned white "Hum, do I need to take an other exam?". If I am honest, I went through the whole process without having (or even trying to have) a clue of what was happening. Happy go lucky I guess. But the Manager found a car and I did my 4 lessons right away. As I am writing, I just need to go get the paper, the pass for a free life, my relief. I wanted to get rid of that before I turned 30, I made it happen. It's a good day.